Salome saw Christ, though not in Christ's tomb. 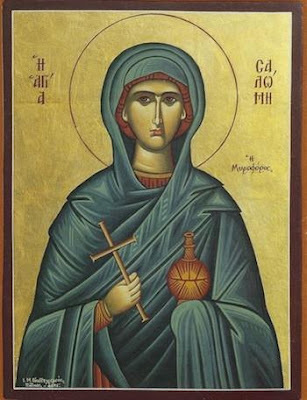 Saint Salome the Myrrhbearer was the first cousin of Mary, the mother of our Lord Jesus Christ. Her husband was the fisherman Zebedee and her sons were James and John the Apostles. Filled with fervent piety, she was among the women who followed Christ and ministered to Him and His disciples. And when all the Apostles, except for John, fled from fear at the Passion and Crucifixion of our Lord Jesus Christ, Salome stood with the other women mourning and beating their chests out of grief. Then, after three days, she was made worthy to be among the joyful Myrrhbearers who were the first eye-witnesses of the Resurrection of our Lord. 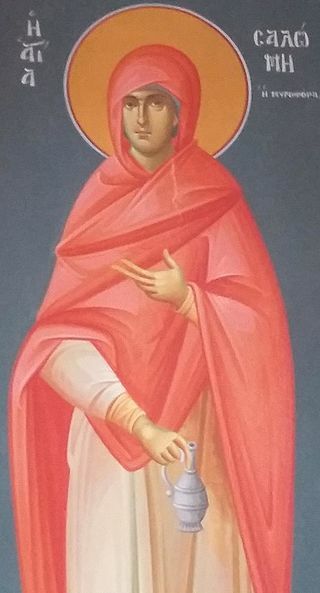 Having helped and served the Church of Jerusalem after Pentecost, she reposed in peace shortly after her first-born son James was beheaded by the soldiers of Herod. Salome was distinguished for her zealous faith and philanthropy. And the midwife went out from the cave, and Salome met her. And the midwife said to her, "Salome, Salome, I will tell you a most surprising thing, which I saw. A virgin has brought forth, which is a thing contrary to nature." To which Salome replied, "As the Lord my God lives, unless I receive particular proof of this matter, I will not believe that a virgin has brought forth." Then Salome went in, and the midwife said, "Mary, show yourself, for a great controversy has arisen about you." And Salome tested her with her finger. But her hand was withered, and she groaned bitterly, and said, "Woe to me, because of my iniquity! For I have tempted the living God, and my hand is ready to drop off.